I finally went to bed at 1 am after working on some new chapters for one of my new books. I was so tired when I went to bed. The Lord gave me 12 souls for Christ last week with 3 of those following the Lord in baptism. Wow! God is so good all the time! I slept in this morning and didn’t wake up until 8 am. I dreamed that I won the world to Christ last night! Ha! Our church wide soul winning night is on Wednesday nights at 6 pm. I was scheduled to go with one of my grandchildren tonight. Meagan works at NOAH’S ARK pre-school until 6 pm. So, I went directly to her work and picked her up for soul winning. We had a great night with 4 trusting Christ as their Saviour. One was Andrew Carter. He is the man in the white shirt. He told me he was a Muslim and had been one for 20 years. He was very kind and congenial! We spend about ten minutes talking and I began to show him Scriptures about what the Bible says about eternal life and eternal death in conjunction with Jesus Christ the Son of God. He told me that Jesus was a good man and good teacher! I told him that Jesus must have been the biggest liar that has ever lived because He said that He was “the way, the truth, and the life.” I asked him if he had any one in his religion that was resurrected from the dead. He said, “No!” Suffice it to say that after a few minutes more he bowed his head and asked Jesus Christ to be the payment for his sins. We started to leave and I saw a man that I had talked too about the Lord many years before. 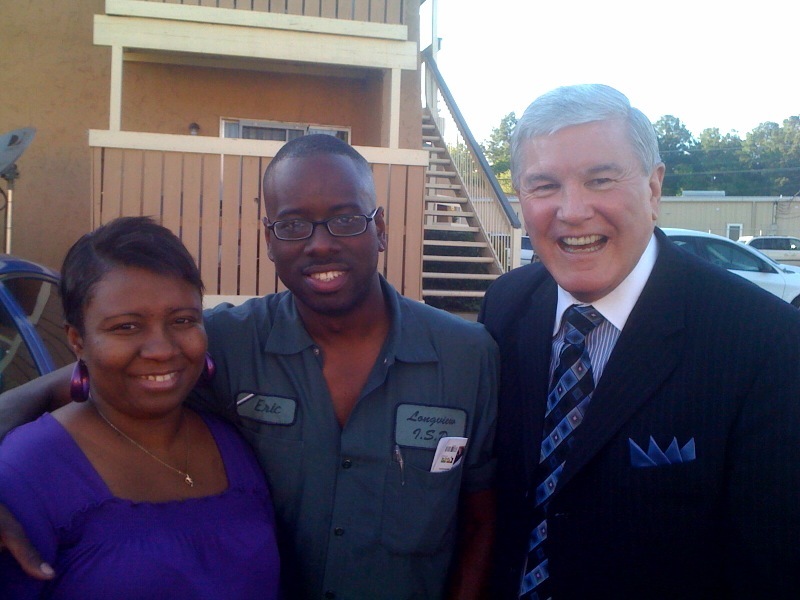 I rolled down my window and said to him and his two friends, “Hey, I’m giving tickets to Heaven away tonight!” He laughed and said, “Hello Pastor Gray!” My granddaughter and I got out of the car and began conversing with them. He introduced me to his friends and after a few moments of getting to know each other a little bit I gave them Scriptures to explain how they too could know for sure that they would go to Heaven when they died. In just a few minutes Kim Thomas and Eric Wilson bowed their heads along with Travis and prayed to trust Christ as payment for their sins. SOMEBODY SAY AMEN! Gotta love soul winning!